Tomorrow I will be allowed to lift more than 30lbs, which means I can really start the recovery from surgery. I've managed to run 6 miles, but it's really the recovery of muscle and losing fat that's the issue here. I will step into the gym tomorrow and get started. Looking forward to it. ... but I probably should. For some reason, there was a dip in sales of this book in between the end of November and just recently. I can guess why it dropped off in December: Lulu had the huge 30%+ discount sales to boost their end of year revenue and everyone (including me) dropped all their spare cash into old school stuff from lulu. The book is rife with advice on how to use the tables to get into a creative state where ideas start to flow. I was in a bored rut dming, and now I am teaming with ideas I am excited to try. Seriously, looking at the table of contents does the book no justice. When I first opened the Table of Contents and saw a section on monsters, I just sighed. I mean really....I have three bestiaries and the Tome of Horrors. What a waste! And then I started reading and I started to get excited about designing a unique monster to mix in the story, and then I started to see adventures and side quests I could do. It is a book on innovative thinking. Every DM or person wanting to take a hand at dming should at the very least read pages 127-128. It is the most concise description of creativity and how to get your mind "there" that I have ever read. That should have been next to the Introduction at the beginning of the book, but it is nice to see practical advice peppered through-out the tables. I was also pleased that the Dungeon Book was the longest section. Reading that helps me come up with ideas for stories--and that is ok.
ToAD is not a random adventure generator. It is a comprehensive tool used to get your creative juices and excitement flowing when you sit down to create an adventure, and when it starts working you stop rolling and reading and sit back and surf the creative wave you forgot you had in you. The book's at a 5-star rating with multiple reviews, which wouldn't impress me when it's based on just one review, but when the 5-star ratings begin to stack up, it's pretty cool. The first awesome thing is a set of maps -- made by the party mapper during play -- of the Tomb of the Iron God. Check these out at Roles, Rules & Rolls! The second awesome thing is still a secret, and it's not about the monster book I'm working on for OSRIC. That's going to be awesome too, but it's not what I'm working on today. Too much awesome, not enough time. Check out two illustrations of monsters from the Swords & Wizardry Monster Book* by Peter Fitzpatrick, who lives in Middle Earth** and has survived earthquakes***. Also ****. *Not in the book, but from the book, much like there are gods of Lankhmar and gods in Lankhmar, except having to do with illustrations and books, rather than gods and cities. This is a fine line (illo/book vs god/city) as demonstrated by the Necronomicon. A book which as far as I know wasn't illustrated by Fitz. Not that I would know. Seriously. ****The link above is to the pdf, and this is the link to the printed hardcover*****. *****Which, as noted above, doesn't actually have Fitz's illustrations in it. I have no idea how you can get this; Jason sent it to me and it arrived in the mail while I was still almost delirious from the poisons and medicines involved in a ruptured appendix and concomitant surgery. Probably you can get one from Jason, but I don't know how much they cost. His blog is Underworld Ink. Zogorion, Lord of the Hippogriffs, is a micro-adventure that works with any old-school game -- stat blocks are for S&W, so it's directly usable with anything from OD&D to AD&D to C&C. Awesome Feature #1: the map is separate from the booklet. Awesome Feature #2: the b/w cover has so many interesting little things going on that you will spend several minutes doing nothing but looking at the cover. Odd Feature #1:photograph of fire-breathing chihuahua on back cover. Plus or minus? Definitely not your normal back-cover material. This is a digest-sized booklet of 16 pages. The font looks like Times Roman and it looks like 12pt to me -- very readable on the fly. The map is detached and is excellent; this module is entirely done by two artists, so the art, maps and layout are all sweet. The fact that it's done by artists somehow comes across in the text. The Lord of Hippogriffs is a chain-smoker and his cigarette stash comes from a portal to a 20th century back alley. The decade isn't specified, and if the characters end up going through it, the results are up to the DM. One gets the sense that it will be hilarious, and this module does NOT back down from entering the realms of the wacky if that happens to be the way it swings. Bring pretzels and beer. Once I finished reading it, I realized that at least for me, the best way to use this would be as a place that has a guy in it. 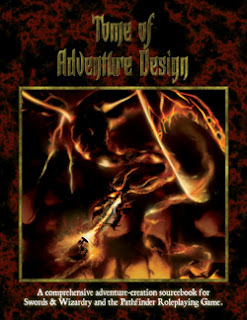 This is a total sandbox location, although the module uses its 16 digest-sized pages on the assumption that there's going to be treachery and mayhem rather than butterflies and alliances. If it leads to an alliance rather than a battle, that's left to the DM -- which makes sense, since beyond that point it's really the campaign again rather than the adventure. So ... the way I'd use this is to spend the 10 or so minutes required to read through it, then use the map on my left and the back cover of the booklet (a monster roster) on my right. The map can't be used as its own DM screen because the illustration has spoilers, as most front covers do. It's incredibly usable. The only real downside I can see here is that it's so short that it might not supply a full gaming session. I'm guessing about 2 hours max, actually. Also, unless the party is really high level, the DM will want to leave out room 9 (easily done since it's a side corridor). Room 9 is the reason that the difficulty level has such a wide range (level 3 to 7). If you are fantasy-serious enough to hate adventures with twists like a chain-smoking hippogriff, a gate to a back alley in 1980 or 1929, or similar wackiness you might not like this one other than as reading material, but if off-road wildness is your bag ... then this micro-module is a total home run. In terms of railroad versus sandbox, this tiny little module immediately zips off the rails and takes off like Ozzie's crazy train. Dragonsfoot has just opened a section of their downloads area for Swords & Wizardry! So far there's nothing it it, but if anyone wants to contribute to it, I think the way to do so is to email Steve: steve [at] dragonsfoot.org. Lulu just emailed me to announce a sale in which the buyer gets a discount without putting in a coupon code -- just put the item in the shopping cart and it will show a discount. However, the discount is a "mystery." I don't know if this means it's random and different to each customer, or whether it's simply a deal where they don't say how much an across-the-board discount is. Or it might vary based on number of books. I have no idea. However, if you haven't taken a look at the store recently, adventure your way over there (a couple of hexes at most!) and take a look.